Kol Bo, laws and customs. Rimini (Italy): Gershom Soncino, [ca. 1520]. Second edition. (This edition was presumably printed based on a manuscript, and is not dependent on the first edition printed in Italy, ca. 1490). Signature (slightly faded) on the title page: "Moshe son of R. Yisrael Supino" (the only person known to us by the name of Moshe Supino was a disciple of the Arizal, who served as his Shochet, following the kavanot the Arizal had instructed him. 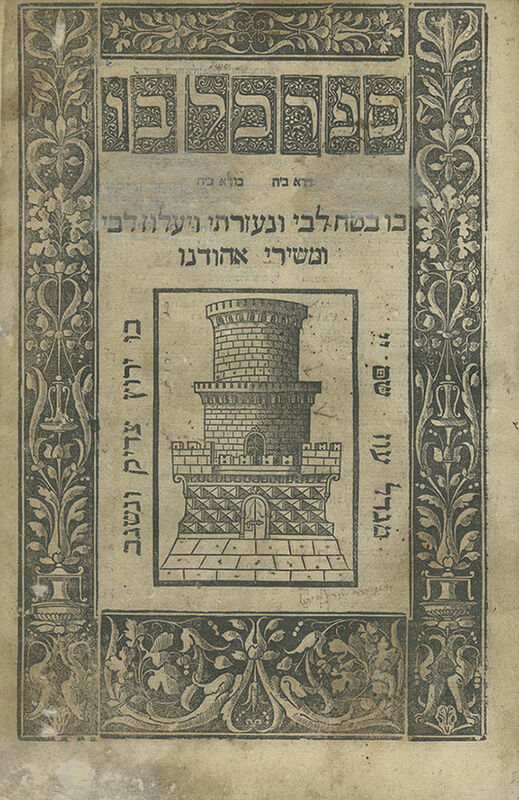 Taamei HaMitzvot by R. Chaim Vital relates that a goat once came to the Arizal on a Thursday, and after speaking to it, the Arizal commanded to go purchase it and have it slaughtered by R. Moshe Supino in honor of Shabbat. R. Chaim Vital then asked his teacher what sin this soul had committed to require reincarnation as a goat). Several glosses, as well as many handwritten references and marks. Censor deletions to one leaf. leaves. 28.5 cm. Thick, high-quality paper. Most leaves in good-fair condition. Stains, dampstains. Wear, worming and minor tears to title page, slightly affecting text and border, repaired with paper. Worming and tears to last leaf and one leaf in the middle of the book (professionally restored). Minor damage to several other leaves. Minor repairs and reinforcement to margins of approx. 15 first leaves and last few leaves. Restored binding (incorporating parts of an early binding). Regarding year of printing, see article by A.M. Habermann, The Soncino Printers, in his book Perakim BeToldot HaMadpisim HaIvriim, Jerusalem 1978, p. 73, no. 79 (in his opinion the book was printed ca. 1525-1526).